For Harry and Lloyd, every day is a no-brainer. Jim Carrey and Jeff Daniels are back as lovable losers Lloyd and Harry in Dumb and Dumber: Unrated. With more than six minutes of never-before-seen footage woven back into the film and an additional 24 minutes of deleted scenes, alternate endings and a retrospective documentary featuring the cast of the film, Dumb and Dumber: Unrated is a must own for every comedy fan! Directed by the Farrelly Brothers, the original Dumb and Dumber catapulted Jim Carrey to superstardom with the simple story of Lloyd (Carrey) and Harry (Daniels), best friends who decide to trek across country to return a suitcase of money to Lloyd's dream girl. Dumb and Dumber: Unrated offers even wilder antics and more of the outrageous humor that made the film a modern day classic. $16.300 million on -unknown- screens. I’ll give directors Peter and Bobby Farrelly credit: the told us their comedic philosophy right from the start. They titled their initial effort Dumb & Dumber, and that concept of inanity has continued through most of their efforts over the last 11 years. Whether that’s good or bad depends on the perspective held by the viewer. I’ve occasionally found some mirth in their work, but I must admit I usually don’t get much from the Farrellys’ efforts and I don’t recall that I cared for Dumber. Still, it’s been more than a decade, so I figured this new unrated edition meant it was a good time to revisit the flick. Dumber introduces us to dog groomer Harry Dunne (Jeff Daniels) and limo driver Lloyd Christmas (Jim Carrey). Both get fired from their jobs on the same day. Prior to his dismissal, Lloyd carts lovely Mary Swanson (Lauren Holly) to the airport. Immediately smitten with her, Lloyd leaps to the rescue when he sees that she leaves a briefcase behind in the airport. Little does Lloyd realize that Mary did this intentionally. It turns out she meant to drop the briefcase for some low-lifes named Mental (Mike Starr) and Shay (Karen Duffy). Mary’s plane departs before he can give it to her, so he takes it home with him. This sets the thugs on his trail, but Lloyd and Harry give them the slip. They believe the goons are agents of the utilities to whom they own money, so the boys head out of town. Lloyd decides to make the most of their situation and seize the day. He urges Harry to go to Aspen to return the briefcase to Mary. Harry agrees, so the pair make the journey from Rhode Island to Colorado. The movie follows their adventures on the road along with what happens when they finally reach the Rockies. What’s changed since 1994: I like Jim Carrey much more now than I did back then. At the time, I saw Carrey as an obnoxious flavor of the month. Obviously he’s not a flash in the pan, and his talents have become more obvious over the last 11 years. I don’t count myself as a major Carrey fan, but I like him and think he can be an asset in the right project. On the other hand, as I alluded earlier, I’ve developed a general disdain for the Farrellys in that period. Since Dumber was their first project, I entered it with no notions about their oeuvre. That no longer happens, as I now go into a Farrelly project with firm preconceptions of what to expect. Dumber follows their general MO, but not to the degree I expected. I remembered it as another of their excessively crude and crass comedies. However, that’s not the case. Yes, Dumber includes more than a few disgusting moments, with the infamous bathroom scene as the most nauseating of the bunch. It doesn’t equal the nastiness of subsequent Farrelly works, though. I guess they needed a hit under their belts before they exploited their toilet tendencies; 1996’s wretched Kingpin was the first really unpleasant Farrelly flick. Compared to it and many of its descendants, Dumber appears sweet and almost gentle. It prefers to dig into the main characters’ general stupidity instead of potty gags. This means it should live or die with the comedy generated by the leads’ idiocy. “Live or die” stands as an exaggeration in this case, though, since I don’t think Dumber falls into either category. I didn’t experience the same visceral reaction provoked by so many other Farrelly works. Dumber was moderately amusing but not strong enough to move me in either direction. I have a few problems with the film. First, like virtually all Farrelly flicks, Dumber is too long, a problem exacerbated by the extended running time of this unrated cut. It includes about seven minutes of additional footage; the theatrical version ran 106 minutes, while this one goes for 113 minutes. 106 minutes was probably too long for this sort of story, but 113 minutes really drags. This is an issue with almost every Farrelly film. Of their directorial efforts, only 2001’s Osmosis Jones clocks in under 100 minutes. Other than the theatrical Dumber and 2005’s Fever Pitch, all the rest of the Farrelly movies fill between 113 and 119 minutes. Comedies don’t usually go for so long, and there’s a good reason for that: they tend to sag when they go past the 100-minute mark. Exceptions to this rule exist, but not many, as longer comedies often lose steam. Even good flicks like 40-Year-Old Virgin and Wedding Crashers don’t live up to their potential due to excessive running times. The lack of a concise plot exacerbates this problem. The whole briefcase story exists as little more than a MacGuffin. It’s a reason for Harry and Lloyd to leave Rhode Island and go through some adventures. When the movie tries to deal with the kidnapping plot connected to the briefcase, it flounders. With a real storyline, Dumber might have held our interest for its excessive running time. However, the movie really works as a loosely connected series of comedic bits. We see Harry and/or Lloyd in a variety of situations and wacky gags. The film jumps from one to another in a jerky manner that lacks much flow. Another issue relates to the nature of the humor. There’s just not a whole lot of variety to the gags, so they grow wearisome after a while. Part of the problem comes from the lack of contrast between Harry and Lloyd. Though Harry seems a little smarter, both really are dumb and dumber, so we see little distinction. Their interactions fail to engage us because they don’t show a way to contrast with normal folks. The film’s main alteration of this formula comes when Mental poses as a hitchhiker to trap the boys. He gets stuck in the front seat between Harry and Lloyd, and their idiotic rapport torments him. Because we see the contrast between a normal person and these morons, their shtick becomes inspired. That was easily the funniest scene in the movie. A few other sequences offer some pretty good laughs, but again, they’re too monotonous to fare well over 113 minutes. How many times can the filmmakers put the boys in silly outfits and expect laughs? More than I’d think, as this concept persists through the film. On the positive side, Carrey and Daniels interact well. To my surprise, Carrey doesn’t overshadow his co-star. Given their usual cinematic personae, I’d expect Carrey to run away with the movie. After all, Daniels never made a name as a wacky comedic actor. However, he keeps up with his rubberfaced pal and manages to balance the flick. For what it’s worth, I regard Dumb & Dumber as one of the more pleasant Farrelly flicks. I like it more now than I did 11 years ago, though perhaps that’s because I thought little of it back then. I just don’t see it as a particularly noteworthy comedy. It has some nice moments but suffers from too many lulls to be better than average. 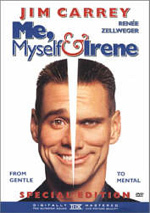 Dumb & Dumber appears in an aspect ratio of approximately 1.85:1 on this single-sided, double-layered DVD; the image has been enhanced for 16X9 televisions. This was a quality transfer without many concerns on display. At times, the image looked slightly ill-defined, mainly because of some light edge enhancement. However, those instances were restricted to wide shots and didn’t occur frequently. The majority of the movie appeared crisp and concise. I noticed no signs of jagged edges or shimmering, and only a few small specks marred the presentation. A film with a bright, lively palette, Dumber offered solid delineation of its colors. The movie included a good variety of tones, and the hues consistently looked distinctive and rich. Blacks were similarly deep and tight, while shadows were clear and smooth. The slight softness and smattering of specks knocked this one down to a “B+”, but it remained a consistently satisfying image. Comedies rarely feature lively soundfields, and that was the case with the audio of Dumb & Dumber. In an instance of soundtrack overkill, the DVD came with both Dolby Digital EX 5.1 and DTS ES 6.1 mixes. If any differences cropped up, I sure couldn’t notice them. I thought both tracks sounded virtually identical. That seemed almost inevitable given their restricted scope. The mixes expanded their auditory horizons on occasion, as the movie presented a good sense of space on the road. We heard some nice surround information for elements like trucks and helicopters, and the elements moved smoothly across the channels. Don’t expect a whole lot, though, as those environmental bits remained the focus most of the time. Music offered good imaging, though, as the songs and scope opened up things well. The soundfields were slightly more ambitious than most films in this genre, but not by much. I felt the audio quality was fine. Speech always seemed concise and crisp, with no issues connected to edginess or intelligibility. Music played the most significant role in the proceedings. Both score and songs came across as lively and dynamic. Effects stayed minor but seemed distinctive and well-represented. Bass offered modest support; low-end was decent but not anything impressive. This was a perfectly adequate set of soundtracks that supported the material. A few extras round out the disc. Still Dumb After All These Years presents a retrospective featurette. It lasts 18 minutes, 34 seconds and mixes movie clips and remarks from producers Charles B. Wessler, Steven Stabler and Brad Krevoy, actor Jeff Daniels, Jesse Borja, Brady Bluhm, Karen Duffy, Mike Starr, Charles Rocket, Cam Neely, Victoria Rowell, and Harland Williams. 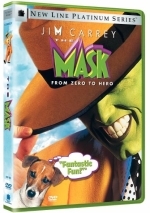 The show covers the film’s genesis and path to production, casting and the actors’ work, the Farrelly style, improvisation, the chemistry between Daniels and Jim Carrey, and the movie’s success. The main disappointment here comes from the absence of either Farrelly as well as Carrey. I’m not surprised that Jim doesn’t show up, but I thought the Farrellys would be here, as they seem to happily participate in this sort of thing. Despite this, “Dumb” offers a good program. It provides real insights and doesn’t censor itself. We get an open look at the film and learn quite a lot about the production, particularly in regard to various challenges. It’s a nice little piece. 12 Deleted/Alternate Scenes fill a total of 29 minutes and seven seconds. These also include a few comments from Daniels, Rocket and Duffy. Many of these come from the road, as we see more of Harry and Lloyd there. We also find a little more plot exposition in regard to the kidnappers, and a mix of other funny bits appear along with two alternate endings. To my surprise, quite a lot of the material is good. Clearly it all couldn’t stay in the movie, as it’s too long already, but expect some nice clips here. In the trailers area, we find the “actual” trailer and TV spot along with the “Dumb” trailer and “Dumber” trailer. The last two are new creations that use movie footage to make Dumber look like very different films. “Dumb” creates an impression of a romantic drama, while “Dumber” turns the flick into an action thriller. Both are creative and fun. More from New Line presents additional ads. We see clips for Harold and Kumar Go to White Castle, The Man, The Mask, and Dumb and Dumberer. At least two Easter Eggs appears here. First highlight “Special Features” on the main menu and move to the right. This brings up an outline of an egg; press enter to see a two-minute and 19-minute clip with Jeff Daniels. He chats about the infamous toilet scene and we see some outtakes in this moderately interesting piece. For the second egg, highlight the “Dumb Trailer” and click left. Then press enter to see a 89-second clip in which Daniels and actor Mike Starr talk about shooting a driving scene. It’s another fairly fun snippet. With three hit movies, Jim Carrey was the breakthrough success of 1994, and Dumb & Dumber capped the year with the biggest moneymaker of the bunch. I don’t think it’s the most satisfying of the three, but it has enough amusing moments to make it reasonably entertaining despite its inconsistencies. The DVD offers good picture and audio. Not a ton of extras pop up, but the elements we find provide quality pieces. This new disc is a good representation of the film.